Middleton Jazz is delighted to be playing again in the Strollin’ Middleton Jazz Festival, starting at 5:00 p.m. in the Middleton Senior Center (7448 Hubbard Avenue) on Friday, September 7th, 2018. This free event is presented by the Greater Madison Jazz Consortium and the Middleton Community Development Authority, with the support of generous local sponsors. 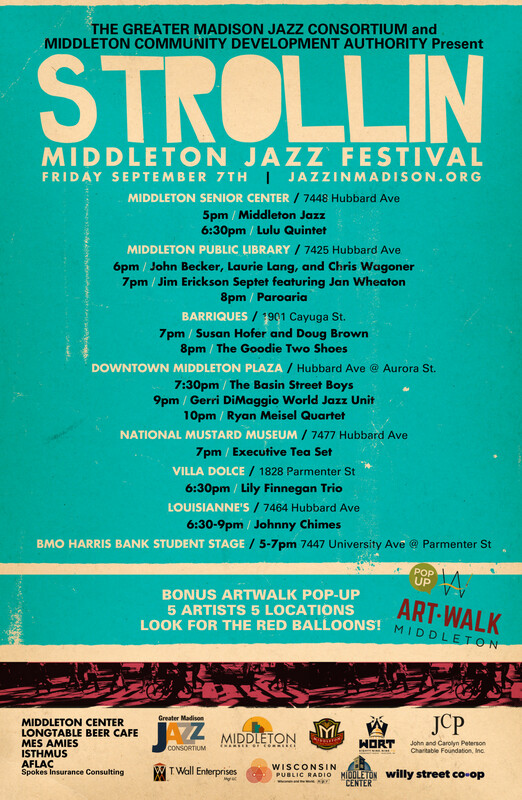 The event invites you to wander through Middleton and listen to live jazz music all evening at the venues listed below. This year also features five artists displaying their art at five different locations.